There are two types of people, those who believe that kitchen with open shelves is handy for storing, plus beautiful and decorative; and those who think utensils, dishes and glasses should be kept behind closed doors. It’s very, very, VERY hard not to fall in love with the open shelving trend. Unfortunately, they are not for everyone. The advantages of open shelves are numerous: to begin with, shelves are much cheaper than the cabinets. They also happen to be very practical because they allow us to have items readily available. Kitchen with open shelves are easier on the eye, which helps create the feeling of spaciousness. That being said, open shelving kitchen demands us to be more orderly and disciplined in our storage habits. If you are not the Martha Stewart type, and you have a tendency towards clutter, you might want to rethink cabinets before you commit. If you have the space to squeeze in a few decorative shelves that won’t be part of the everyday kitchen hustle, go right ahead, they are beyond lovely. But open shelves require us to be neat in order to pull them off. 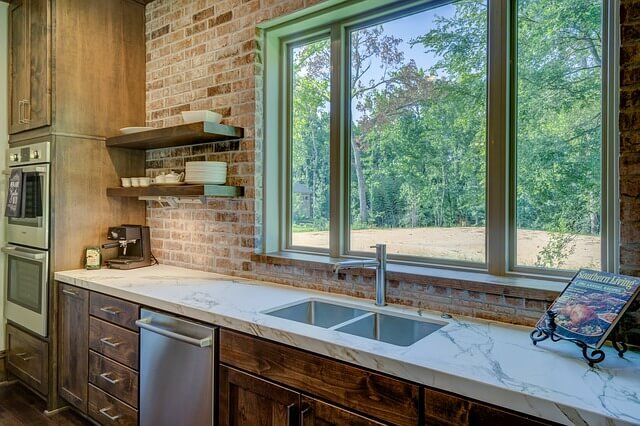 Let’s explore the ways you can incorporate open shelving into your kitchen. The first way is to place only 2 or 3 shelves. It’s the ideal solution to partly adopt this decorative style and not be haunted by order anxiety. The second is to reserve the top half of the space for open shelves and keep your closed cabinets beneath. You will open up the space, because open kitchens feel airy and light. The third way is to use only open shelves without any cupboards. As in love as you might be with this idea, you won’t have room to hide clutter. You will be showcasing everything. Your decorating abilities must be above average, so everything is visually harmonious, orderly and inviting. And practical. Because if everything looks beautiful, but doesn’t adapt to your everyday needs, then you’re bound to have a mess. If you’re like me, and have fallen for the open shelves fever, here are a few tips that will help you nail your kitchen with open shelves. Be selective and practical. Choose what you really use, and place it near your working stations so clutter is avoided. Keep the mugs close at hand of the coffee maker, and so on. You don’t have to display every mug of coffee you own, be selective about it. Stay with what you like and what you use the most. Arrange objects in a way that makes sense to you, it can be according to the frequency of use or by type of objects. Arrange the dishes as you would if they were inside closed cabinets. A trick is to identify a connecting color palette that brings all your pieces together. A golden rule: place your most used items at the bottom, and keep the more decorative items on top, where you have less access to them. Pick wisely though, heavy items shouldn’t be placed on top shelves regardless of the amount of use. They could fall and injure you. In the kitchen we have many tools that are necessary, but not necessarily beautiful; keep these hidden. Save the practical items, such as baking supplies or occasional utensils in containers or baskets. Store sugar, flour and other ingredients commonly used in transparent or colored containers maintaining the same model throughout. This gives continuity and visual order. If you’re worried about your less used dishes gathering dust, You might want to leave the shelves for decorative elements. For example, add a flower vase, plants, baskets, containers or ornaments, and also glass and metallic jars where you keep vegetables, pasta and flour. This way you can keep your dishes dust free. Install the shelf away from the hob not to collect grease. Opt for closed cupboards if you need to put some extra storage near the cooker. Open shelves are perfect for showing off the dishes that you got as wedding gift and you never use. Do not be afraid to mix style and color, and include some unexpected vintage pieces. great post Oriana, thanks for sharing. Dust alert – Really good point!